Water Quality Sell Sheet | Lubrizol Advanced Materials, Inc.
Water is our most critical resource, but for too long we’ve taken it for granted. Recent water quality crises have raised awareness that we must be vigilant to ensure the water in our homes is clean and safe for ourselves and our families. It is critical that all associated with plumbing and water quality, take responsibility to minimize any risk of contamination. 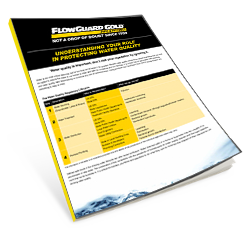 Using products like FlowGuard Gold CPVC piping systems are something to keep in mind. Download this FREE sell sheet today.